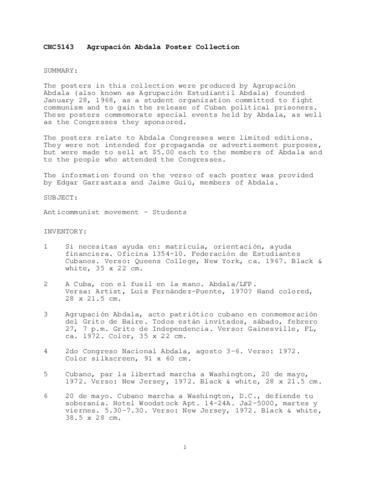 The Agrupación Abdala collection contains materials and posters documenting the Cuban student activist group Agrupación Abdala (also known as Agrupación Estudiantil Abdala). The group was founded on January 28, 1968, as a student organization committed to fight communism and to gain the release of Cuban political prisoners. The posters commemorate special events held by Abdala, as well as the Congresses they sponsored. The information found on the verso of each poster was provided by Edgar Garrastaza and Jaime Guiú, members of Abdala. Other materials include correspondence, conference proceedings, scripts and outlines for radio and television communications, pamphlets, and organizational statutes and by-laws. Gifts of Gabriela Rodriguez Guiu, 1987; and María Eugenia Soler, 2014.